Easter is right around the corner, this coming weekend in fact. Of course when you have kids, Easter largely means candy. My friend Megan is super craft oriented and also the kind of mom that if the kids are going to have candy she would prefer to make something and know the ingredients rather than have store bought. She asked me if I wanted to come over this last weekend and help her make some easter candy. She and I have made peanut butter eggs and chocolate hazelnut eggs previously so I knew what I would be in for and that it would be fun. We didn’t really talk about what we were going to make specifically and in fact decided right before we walked over to the store for some last minute supplies. Of course we would make peanut butter eggs again, but this time I found a different recipe for the peanut butter filling. This one used cream cheese as the base. The recipe for those will be in a follow up post later this week. 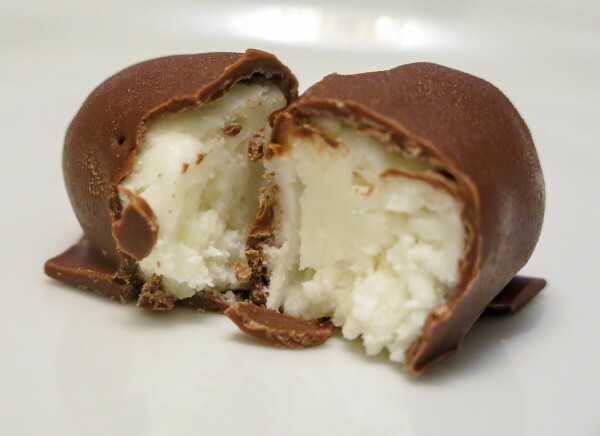 After a couple minutes searching the web she also found a recipe for coconut cream eggs. Personally I am not a coconut fan, but I was game. I don’t need to be eating a ton of candy anyway so this way I wouldn’t even be tempted, and I would have something else for here. This recipe was also cream cheese based so it seems we had a theme going. This recipe is surprisingly easy to make. You only need 1 bowl really and can mix it all by hand. We used the kitchenAid stand mixer because it was there, but it seemed like a bit of overkill really. 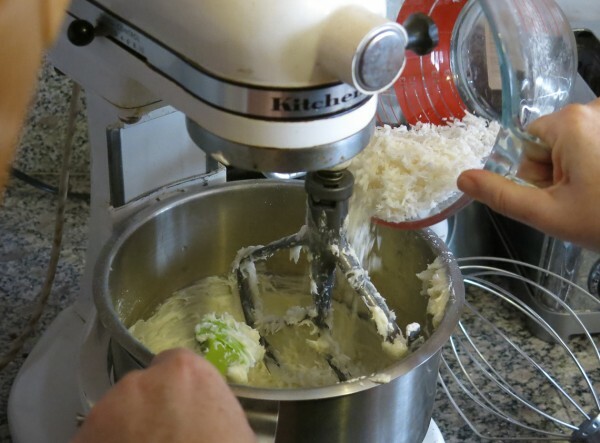 All you need to do is cream together the cream cheese and butter, then add the powdered sugar and the flake coconut. Mix it all together and put the mixture in a container to be put in the freezer to chill, until its hard enough to make the eggs. The consistency of this was similar to a thick cake frosting. Its definitely a lot stickier than I remember the peanut butter mixture being. I can see why the recipe called for longer freeze times than the other recipe, which of course we completely ignored. Once its been in the freezer for awhile you can then take a couple of spoons and portion it out. And this is where I think ignoring the timing was a bad thing. Even though they suggest dusting your hands with powdered sugar, it proved to turn really sticky quite quickly, but we powered through. We made them vaguely egg shaped (ish) though admittedly we really didn’t put a lot of effort into their shape. Once all the ‘eggs’ were shaped they were put back into the freezer to harden before coating. As you can see in the photo they seemed kinda ‘spiky’, so after they had been in the freezer awhile we added a step. We pulled them out and smoothed them down a bit with our hands. Obviously then they went back into the freezer. The chocolate coating we did the same as last time. A bag of semi-sweet chocolate chips and a bit of shortening, microwaved in intervals, and mixed until totally melted. Then you just drop in the egg, roll it, pull it out on a fork, letting the excess chocolate drip off before placing it on a tray covered with wax paper. Once they were all coated we put them in the fridge to harden. 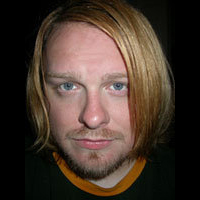 As you can in the photo below I was not bringing my A game to this process. These are not the best looking chocolate eggs you’ve ever seen, but hey you can tell they are homemade. I really should have drizzled the remaining chocolate over them to fancy up the decoration a bit. Oh well, next time! And thats all there is to it. For this recipe I think the hardest part was working with the filling due to it’s consistency. But I suspect if we had followed the recipes proper timing suggestions it might have been a lot easier. 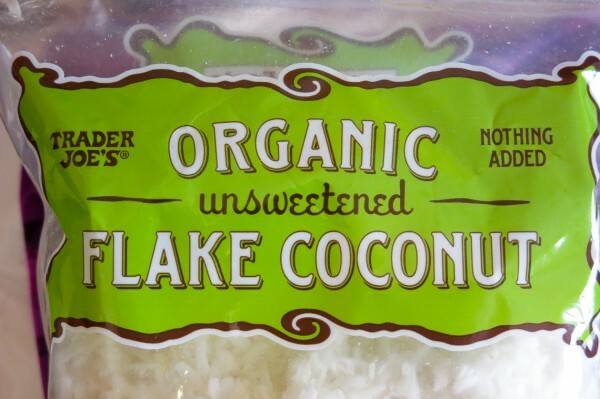 As I mentioned, coconut is not my thing but the taste test was given enthusiastic thumbs up from their household so they sound like a winner to me. As always the recipe is below. This recipe is originally from Taste of Home. 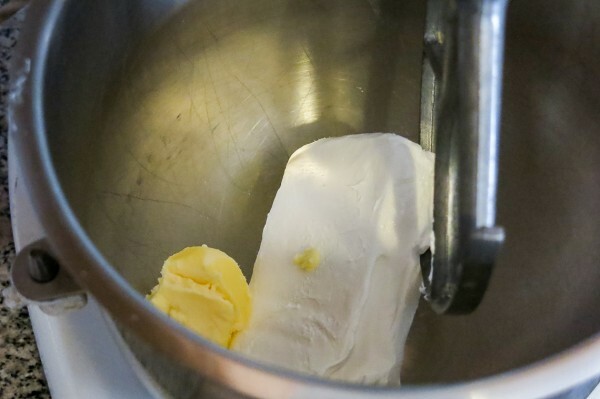 In a bowl, mix together the cream cheese and butter until smooth. 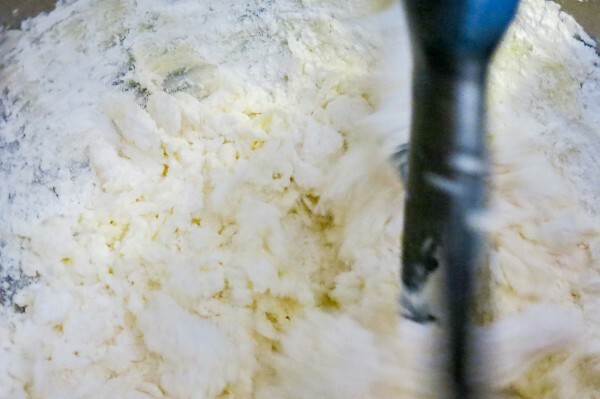 Add powdered sugar and flaked coconut, mix well. 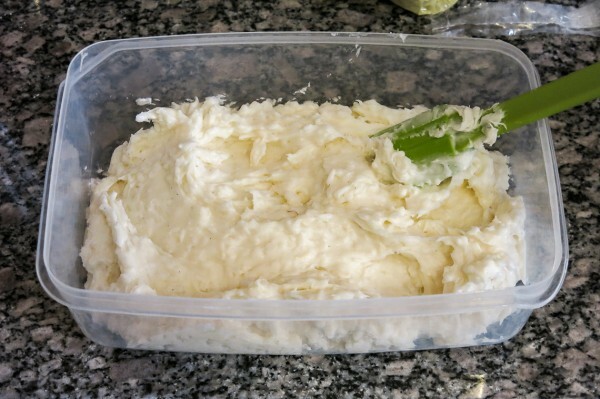 Place in a container and refrigerate for 1.5 hours or until easy to handle. 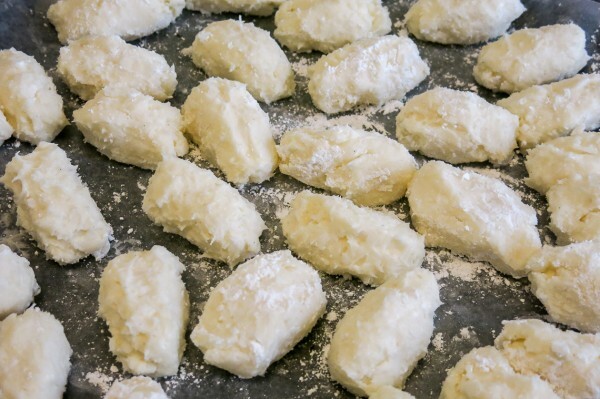 Using hands dusted with powdered sugar, form portions of coconut mixture into egg shapes. Place on a baking sheet covered with wax paper. Freeze for 2 hours or until slightly firm. 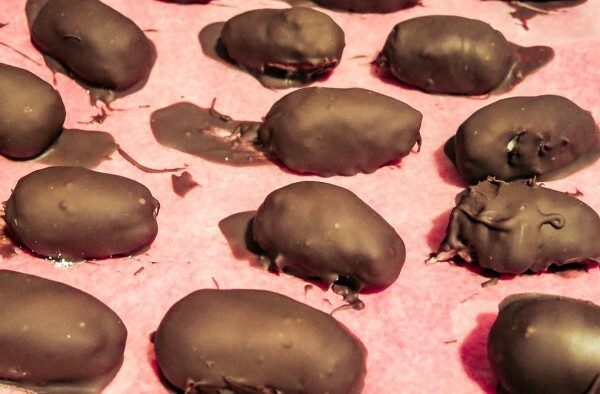 Melt chocolate chips and shortening in the microwave, 30s at a time. 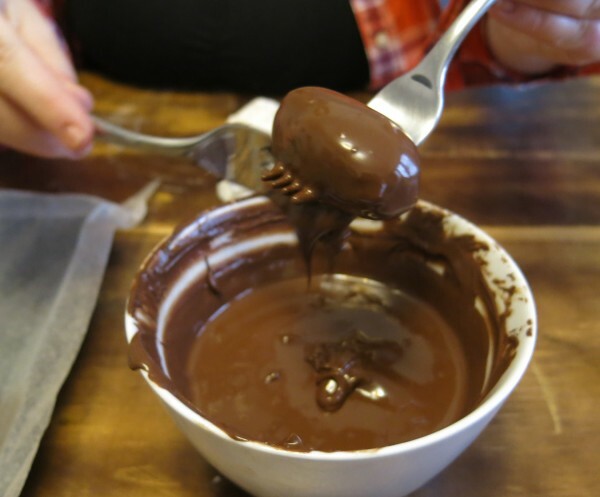 Dip into chocolate mixture until completely coated.